FINANCE PACKAGES FOR ALL CIRCUMSTANCES. NIL DEPOSIT AVAILABLE. PART EXCHANGE WELCOME. DEBIT AND CREDIT CARDS ACCEPTED. 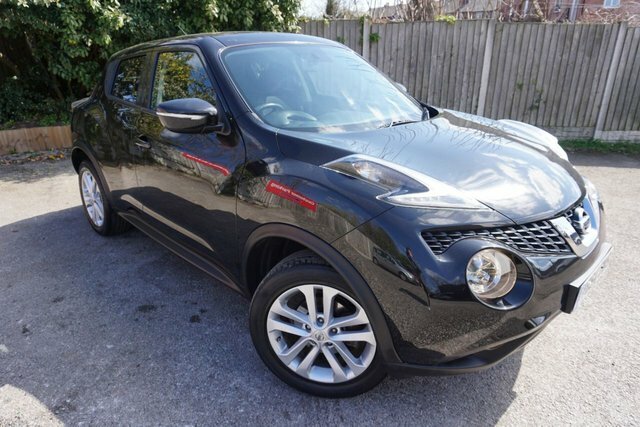 Here we have a very nice, low mileage example of a Nissan Juke 1.5 DCi Acenta finished in Panther Black with a contrasting Charcoal Interior. 3 Stamp Service History., New MOT when Sold., 6 Speed Gearbox., Bluetooth system, Air Conditioning, Climate control, Electric speed sensitive power steering, Cruise control + speed limiter, Electric front/rear windows, Electric door mirrors, Remote central locking, Aux input, USB port, Stereo radio/CD player and MP3 facility, Steering wheel mounted audio controls, Leather steering wheel and gear knob, LED daytime running lights, ABS Braking system, ESP + traction control, Driver and passenger airbags, Driver and passenger side airbags, Passenger airbag deactivate switch, Steering wheel rake adjustment, Height adjustable driver's seat, Grey centre console, Front and Rear Head Rests., 12V socket, Isofix child seat preparation, 60/40 split folding rear seat, Body coloured bumpers, Body coloured door handles, Body coloured door mirrors, LED indicators in door mirrors, Privacy glass, Dark chrome grille, LED front fog lights, Alloy Wheels.